Liverpool are apparently interested in signing Eintracht Frankfurt loanee Luka Jovic in the summer, according to a report today from LFC Globe. 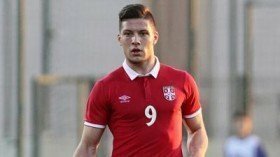 Jovic, who will head back to parent club Benfica at the end of the season, took the football world by storm when he managed to score 5 goals in one game against Dusseldorf in the Bundesliga a few weeks back and it is a little surprise top European clubs are lining up for his signature. Jovic, who has been referred to as ‘The Serbian Falcao’ in his homeland, has all the qualities required to be an elite level striker and has even been tipped by former team director at Red Star Belgrade, Zvezdan Terzic, to be “become the best striker in Europe”. However, even though Klopp has registered his interest in signing the 20-year-old, any deal could end up being a complicated one; Frankfurt have an option to buy at the conclusion of his loan spell. With a host of European clubs now keen on Jovic though, Benfica may decide to sell him elsewhere and make a profit on the striker and with his current contract set to run out in 2021, there is a firm belief they could secure around £20m for his services. Clinical, quick and with 9 goals and 3 assists in only 13 outings this season, Jovic seemingly seems the perfect fit for Jurgen Klopp and it’s hard to think of a better replacement when Origi inevitably departs.